The Simsang foot-bridge is a convergence initiative between the MGNREGS and the Integrated Basin Development & Livelihood Programme (IBDLP) of the State Government. 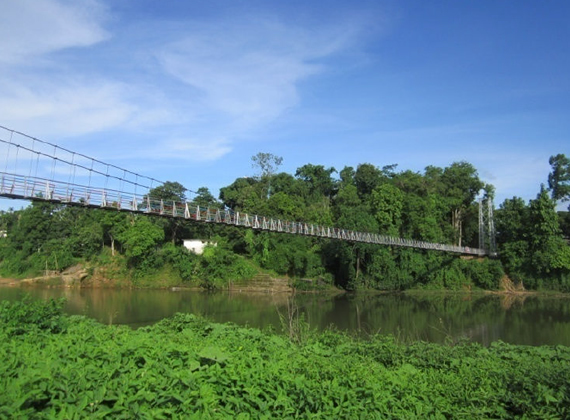 The Simsang foot-bridge connect two important river basins of the Garo Hills District, namely the Simsang and Daring. 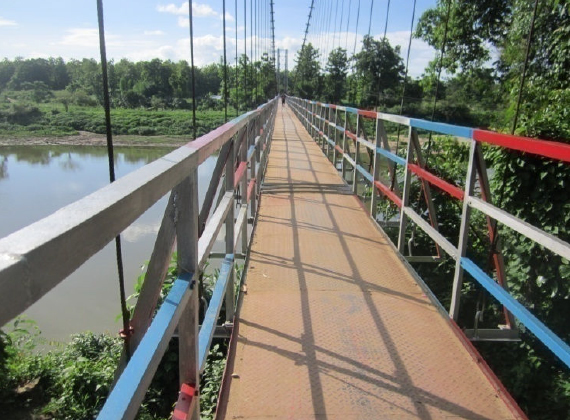 The foot-bridge was to connect the villages across Simsang river with Williamnagar town. The river has a history of flash floods and ris ing water level during the monsoons and destruction of houses and properties situated by th e river-side. The only mode of transportation for the local people was the traditional boat that served the purpose of transporting people as well as goods. 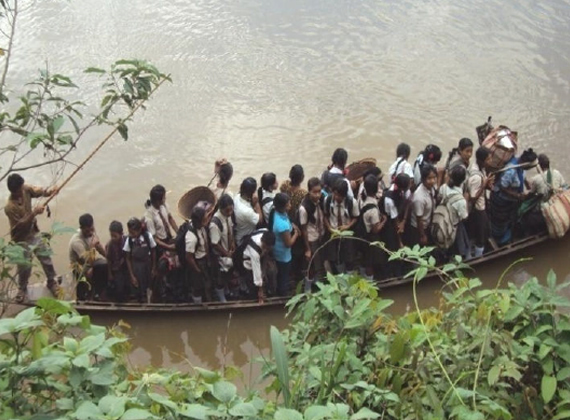 Absence of proper transport during the mo nsoons led the district administration of East Garo Hills District to build a suspension foot-bridg e across the Simsang river, in collaboration with 5 Village Employment Councils (VEC). The ambitious project was approved and sanctioned during the financial year 2011- 12. The 1 st phase of ground work started from 1 st week of September 2012 and completed during March 2013. The 2 nd phase started in March 2013 and ended during May 2013. The Suspension Foot-bridge was estimated for an amount of Rs 1,05,16,000/-(Rupees One Crore Five Lakh Sixteen Thousand Only). The cost borne under MGNREGA was Rs 81,805,33/- in addition to the Rs 3,92,500/- contributed by the community. The contribution of the IBDLP during 2013-14 was Rs 19,42,967/-. 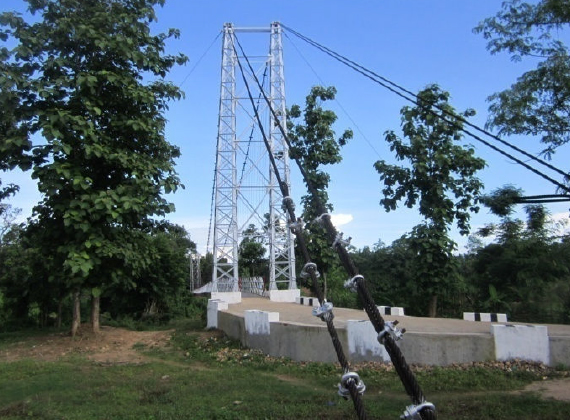 Initially the span of the suspension foot-bridge was 160.0m in length and 1.25m in width. The length was later extended by 15.0m. The completed span of the Foot-bridge is 175.00m in length and 1.25 mts in width, with steel fabricated pillars on both sides along with RCC anchor blocks and wind ties for the overall support of the bridge. The bridge has three wire ropes of 38mm diameter and at the top four wire ropes of 38mm diameter. The enthusiasm and dedication shown by the 5 VECs to contribute their wages earned under MGNREGA, with an average of 20-30 person-days per household for three consecutive financial years, has led to the completion of the project. The footbridge is a success of the MGNREGS in Convergence with other Stake-holders as it promotes not only the eco-tourism of Simsang river and other parts of Williamnagar but provides a lifeline to people that desperately needed a safe and secure mode of commuting. This one is a remarkable success story of Convergence in Meghalaya.